Made in 48 hours by @foolmoron for Ludum Dare 38. Try to meet way too many people at once and become a true social master of this small world! Inspired by Malcolm Gladwell's dumb book of the same name, and Persona 5's ridiculously cool style. 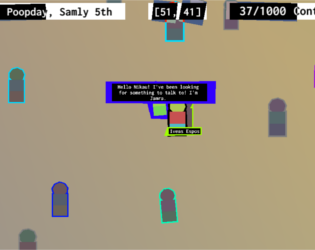 STAND AND TALK FOR A WHILE with people to raise your friendship level with them (level 1 = colored border, level 2 = colored body, level 3 = hyper animated border). They will then introduce you to people over time. Make sure to come back and talk with your friends every few days or else they will forget about you! MEET ALL 1000 PEOPLE TO WIN! Sorry, there's no audio! But feel free to put the Persona 5 soundtrack on loop in the background while you play. That's how I developed the game, after all! Love this game!! Soo cool and cute!